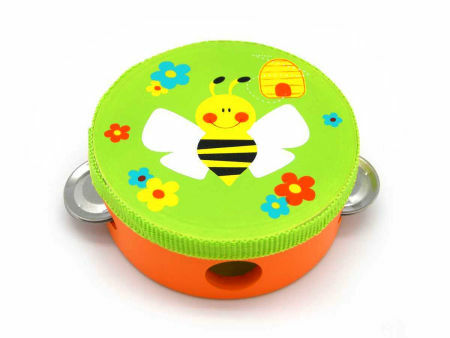 Wooden Toy Tambourine Bee is an lovely wooden musical instrument decorated with a happy bee. This little tambourine has three pairs of metal shakers and makes a gently noise as you shake and tap it. This is a well made wooden toy with a nice thick frame and tough vinyl skin. Material: Wood, Child-safe paint, metal, vinyl skin . We like this because: "Great quality lovely image."